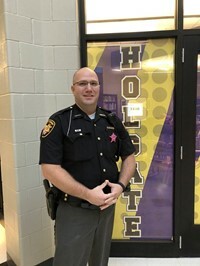 WELCOME to our new School Resource Officer, Deputy John Cooper!! Deputy Cooper will be on staff officially on Thursday, Nov. 1st. He will be in our facility 4 days per week. The 5th day we will have our DARE officer, Deputy Ryan Zumfelde here as our SRO. We're excited and grateful to Sheriff Bodenbender and the Henry County Sheriff's Office for this opportunity to increase the level of safety/security for our students and staff. Deputy Cooper is a graduate of NW State and has been in law enforcement since 2007. He is in his 4th year with the Henry County Sheriff’s Dept.